Since its launch, NaMo TV is in controversy over its legality and ownership. Opposition parties have alleged that the channel is a "brazen violation" of the Model Code of Conduct (MCC). Several Opposition parties, including the CPI(M) and Congress, have written to the Election Commission demanding action against the BJP over the channel. On Tuesday, the EC had issued a notice seeking a report from the Information and Broadcasting Ministry on NaMo TV. In its reply, the ministry has reportedly said that it is an advertisement platform, launched by DTH service providers, which does not require government nod. 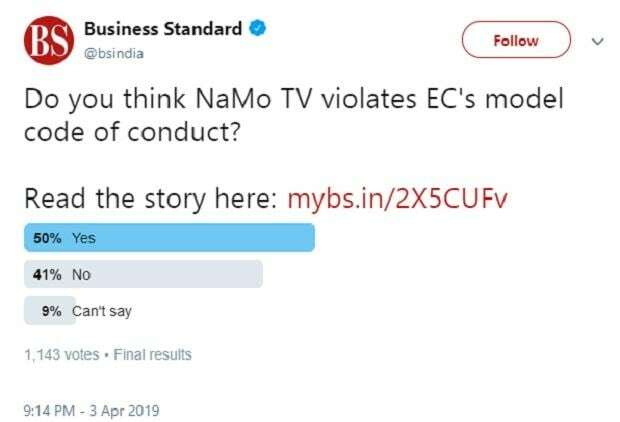 Meanwhile, Business Standard conducted a poll to know what people think about NaMo TV. In the poll conducted across Facebook, Twitter and its website, users were asked if they believe that the channel violates model code of conduct. Of the over 11,000 people who voted in the first 24 hours, majority of them opined that NaMo TV was a violation of the model code of conduct. The question: Do you think NaMo TV violates EC's model code of conduct? Overall, 94 per cent users responded 'yes', while the rest 6 per cent said 'no'. Facebook: Of the 520 votes, 53 per cent people responded in the affirmative. The rest 47 per cent said 'no'. The ones who did not agree to the view that the channel was violating model code of conduct opined that several political parties were running their propaganda channels for several years now. "If EC didn't object to them, what's the big deal now," asked one user.